“Is helium flammable?” Thoughts of the Hindenburg leap to mind, but a quick Google search tells me that the zeppelin used hydrogen and that helium is not flammable. Still, these are probably not the words you want to hear as you are dropping your little darlings off for a day of spiritual growth and fellowship. What’s going on here? It’s summer, it must be time for Vacation Bible School (VBS)! While the Catholic faith is the strongest pro-life advocate around, it is fair to say that children are not always treated in a welcoming manner. In the spirit of World Youth Day starting, which starts in Poland on July 25, maybe we should look to how we engage our youngest members. No matter how many “My Mass” kits, “Search the Church” look and finds, Magnfikids or coloring books you bring, a long, complicated Mass that goes over the heads of even the best-catechized children is a hard push. Once a year, though, the Church reaches out to kids with a slew of crafts, games, videos, songs and skits wrapped up in the colorful bundle of VBS. “Cave Quest” was the camp theme this year- think spelunking, lizards, bats and creepy crawlies. The kids got to make cave snot in crafts, you get the idea. I volunteered to spend time with my daughter but, as I was the only adult willing to read from a binder on the stage, I was transferred out to a remote building for Deep Quests: Bible Story Theater. My 5-day stage career as “Adult Leader” had begun. Since it topped out at 105 degrees that week with about 90% humidity and I got to be inside with the AC, I did not protest. Let’s see how it went. I wade through costume racks of artfully-sewn bed sheets with about 10 middle and high schoolers, who make up the cast and crew. I am given a long black dress and two 25-yard lengths of blue faux silk that I am supposed to drape artfully around my frame. In the stage area, a bright blue cloth River Jordan runs through a papier mache Holy Land. Scraggly potted ferns and trees line the stage. A plastic baby pool sits lower Stage Left, waiting to be filled with water. Although Jesus will be baptized with this water, he has been instructed not to get his costume wet. Today is Jesus calming the storm and walking on water. The Sea of Galilee is an expanse of blue tarp with balloons secured beneath it to realistically create storm waves on the sea. The “storm” hits and balloons begin to pop, making the scene sound more like the D-Day invasion or a night out in Compton than a Bible story. When I ask my daughter what she is enjoying most, tells me about the snacks each day, in which Jesus is represented by a gummy bear. I kind of love this idea. He was buried in cereal on Day One (finding the treasure) and on Day Two, Gummy Bear Jesus strode across a sea of blue Jell-O. We are doing to the Sermon on the Mount and I am silently grateful this generation has not watched Monty Python’s Life of Brian. I cannot get “Blessed are the cheesemakers” out of my head the entire day (not unlike our trip to Mt. Beatitudes). The bread cannot be found for the feeding of the five thousand. In a last-minute prop switch, Pop Tarts and croissants from the snack table are substituted. I wonder if the disciples preferred Frosted Strawberry or Brown Sugar Cinnamon? Our son as Pilate, appealing to the crowd on behalf of Jesus. Jesus commented that Pilate was not very imposing! We literally have leaping lizards coming from the ferns. Tiny geckos disperse through our room as we bring them in from their watering outside. They will show up in the audience later. I helpfully point out that they will go great with the cave theme. There are no lines for the cast today – just pantomime. Only the narrator and I will speak, saying sorrowful mysteries of the rosary plus one glorious mystery as the kids reenact the Passion and Resurrection of Our Lord. I have my own sorrowful mystery going on right now. The script calls for me to lead 5 full rosaries – with an extra decade. A quick calculation reveals that I will be saying 275 Hail Marys alone today in the space of two and half hours. My son has joined the cast. A quick side note here. As you know, Liam is high-functioning autistic. We tried sending him to VBS at our old church but he was asked to leave after two hours. A quick shout-out goes to Austin Christian Fellowship, where he was able to attend their VBS, Mega-Camp Fun for five years. No knock on our church, but this was the best VBS I have ever seen. They had so many willing teens volunteering that they could assign one of their stock Aeropostale models just to be his aide. There was a full rock band and amazing positive energy as all the kids conga-danced around the auditorium. You felt the joy of the Spirit there, especially at the water slides brought in for the closing party. He didn’t need to learn a lot of theology, what he gained was a strong foundation in the joy of faith. 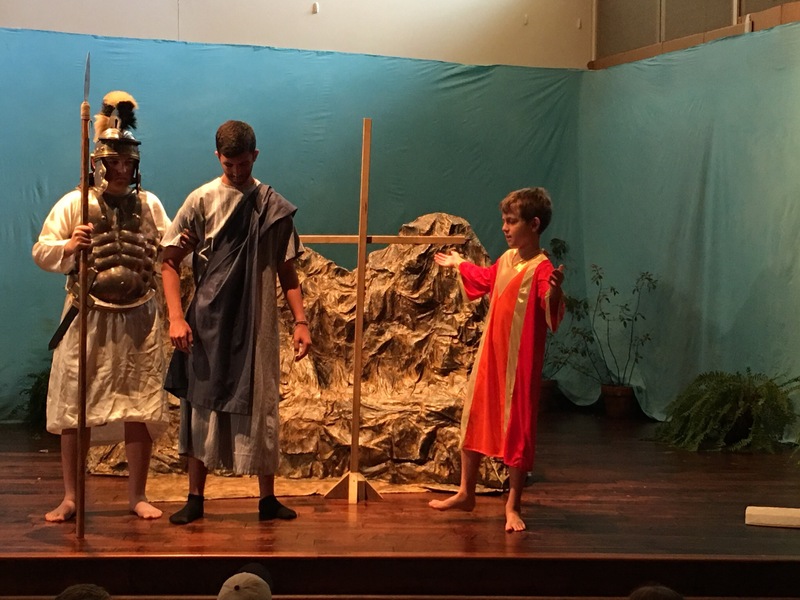 Now going into 6th grade, my son is old enough to volunteer and he will play Pilate. He has always had a problem with the Passion and I think this might be an issue. Sure enough, he insists on holding Jesus’ hand through the entire scene and shakes his fist at the crowd when they shout for him to release Barabbas instead of Jesus. At the end of the day he is upset with me for two reasons: (1) He feels responsible for Jesus’ death and (2) He did not get enough stage time. There is not much discussion with the kids today due to the format but I am pretty sure at least one is praying for an end to abortion. 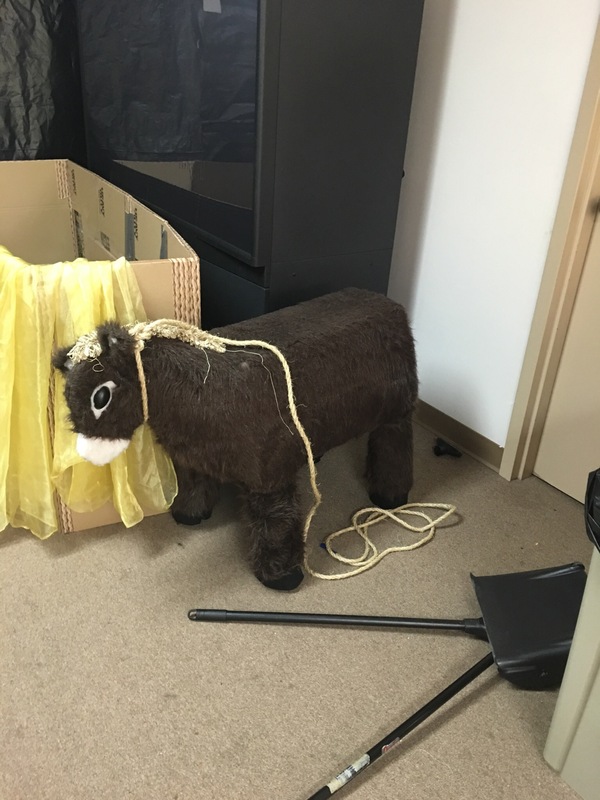 Tommy the donkey recovers from the Sermon on the Mount in the prop room. For our closing show, we are acting out the post-Resurrection story of the disciples in the Upper Room and Jesus’ Ascension into Heaven. My son, now Disciple 4, has two lines, which he manages to improv into about 6 lines, plus dramatic gestures. I am happy to speak less, as my voice is suffering from Post-Traumatic Rosary Syndrome. I am impressed with how the producers have arranged blue netting and non-flammable clouds, in conjunction with a ramp and ladder, to allow Jesus a graceful Ascension to heaven. However, when I ask the kids what they think about Jesus’ ascent, I am informed, “It was a ladder!” There is no contribution from the Pro-Life section today. As our week closed, I was happily surprised by our family Mass on the last day. 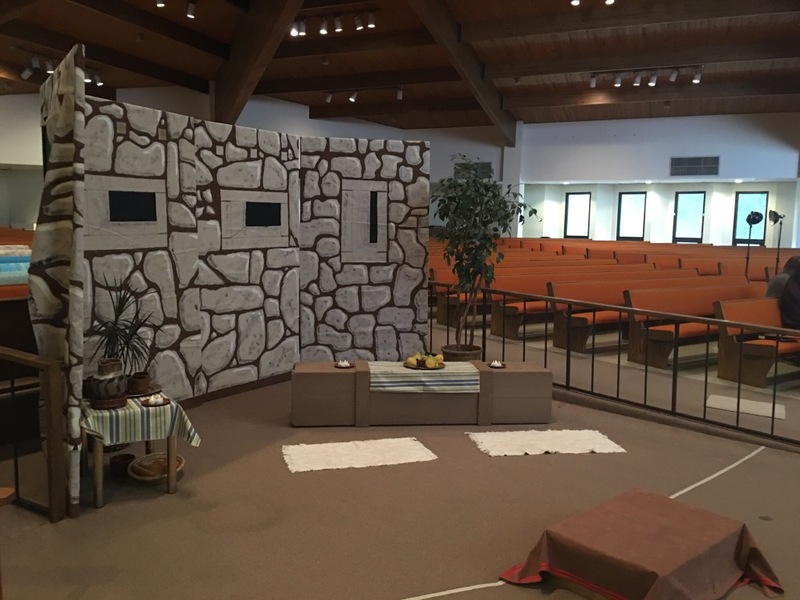 Because VBS families were encouraged to attend, the service was moved to the main church. Enthusiastic kids in bright t-shirts sang the peppy songs they had learned all week in the service with a great guitarist. Our priest gave a lively homily aimed at the kids and encouraged them to shout “Amen!” throughout the service. The regular daily Mass attendees had bemused smiles on their faces and the overall atmosphere was one of – dare I say it? – joy! It occurred to me that maybe there is a place for more of this in our Church. I understand the need for sacred, sober ceremonies and the beauty of tradition but we also need to balance this with happiness, fun and passion. There is nothing wrong with engaging our future. After all, aren’t we all supposed to have the faith of children? Previous Post A Bottle of Red, A Bottle of White . . . Or the Wedding Bell Blues? Your VBS looked amazing!! I ran ours this year and although I thought it went very well, your props and plays seem so much better. We are already planning next year and I hope to incorporate more theatre into ours. Maria- The ladies who do this have been putting things together for years – don’t give up hope! Also, check out the Pinterest boards early next year. They have great inspiration. Thanks for reading!